We have you covered – so you can enjoy the safety and security of a perfectly functioning door once again. Our team have an unmatched level experience and knowledge to help you with all makes and models. Your door repair in Perth (north or south of the river) is our priority. We’ll be with you in 24 hours to fix your door quickly and efficiently! Get in touch by clicking below. We’ll be in touch within 24 hours! Book a repair – or just enquire here! We often help repair or replace all garage door openers and remotes, including Merlin, Chamberlain, Herculift, Marantec, Guardian, Boss and many more. Roller Door or Garage Door come off its tracks? If your roller door has come off its track, it will require urgent, expert repair as this can quickly become a serious safety hazard. 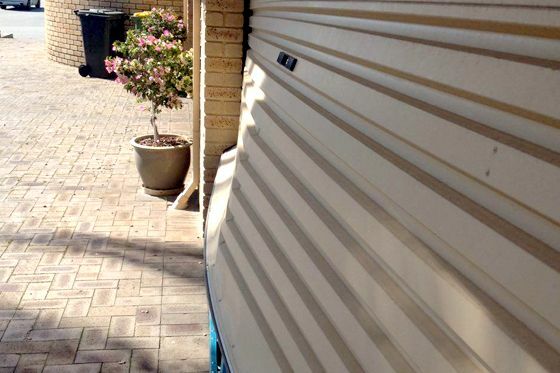 Roller doors that have fallen off their track can fall in or completely collapse. Don’t risk your family’s safety; call us for help. We’ll get your door repaired quickly and correctly – and have it back in full working order. When a door has alignment issues or poor service history, the cables can stretch and fray. This causes issues with the balance of your door. If you’re experiencing this problem, Guardian Doors can replace your cables and service your door, getting you up and working in no time! Cable replacement of any size can be completed on the spot, with Guardian Doors also completing a service to ensure your door is balanced and prevent this damage from happening again. Has your garage door been impacted? If your door has any dents or damaged panels Guardian Doors can replace or repair them. If you’re after a replacement, we can search the market for a matching replacement panel, then fit the replacement and service your garage door, bringing it back to new once again. Our Guardian Doors showroom in Wangara stocks a huge range of parts and products. And, our technicians’ vehicles are fully stocked to cater for all your service needs. When making an appointment, discuss your needs with our friendly, knowledgeable staff. They’ll be happy to help! Guardian Doors technicians are experienced in the service and repair of all door makes and models. We regularly complete servicing on a wide range and style of doors – even our office staff are trained. So no matter who you talk to, you’ll always be dealing with a knowledgeable professional. Find out more about servicing here. Got an emergency? Call (08) 9408 1602 now! We’ll be there within 3 hours, any time, 24/7, 365 days a year. Need garage door repairs or urgent advice? We’re here to help. WHAT’S THE MOST COMMON GARAGE DOOR REPAIR? Repairing the internal gearing on the motor is probably our most common garage door repair. This is due to a lack of servicing, and also snapped springs. The springs rust and dry out, especially with Perth’s salty air. Without a service, your door deteriorates rapidly, causing these items to fail frequently. And when they fail, they will render your door useless. So please remember, prevention is better than cure. HOW SOON CAN YOU ATTEND TO MY ROLLER DOOR REPAIR? DO YOU PROVIDE WORKMANSHIP WARRANTIES FOR YOUR GARAGE DOOR REPAIRS? Yes, all Guardian Doors work is covered by our minimum 12 months’ workmanship warranty. CAN I BOOK IN MY DOOR REPAIR OVER THE WEEKEND? We have select Saturday appointments available for those who can’t arrange a repair time during the week. MY GARAGE DOOR WON’T CLOSE? MY GARAGE DOOR WON’T OPEN? ARE GARAGE DOOR REPAIRS DANGEROUS? HOW LONG SHOULD A GARAGE DOOR MOTOR LAST? The lifetime of your garage door motor depends on the amount of servicing it’s had. If your door has been regularly serviced by a professional garage door company, you can expect anything from 10-15 years from your garage motor, or even more, in many cases. WHY DOES MY GARAGE DOOR STOP AND START AT DIFFERENT PLACES? 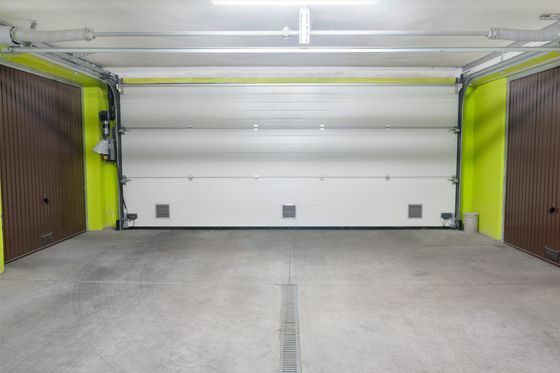 If your garage door is stopping and starting in different places, it’s likely that it hasn’t been serviced in a while, and your motor may have started to develop mechanical issues. Book a service to have this rectified. HOW DO I FIX MY ROLLER DOOR? Garage doors have lots of moving parts, so depending on your problem you may need to call in the professionals to fix your door. CAN I OPEN MY GARAGE DOOR IN MANUAL? Every garage door motor has a manual release, so yes. For specific instructions contact Guardian Doors, and we can talk you through the details over the phone. HOW DO I FIX MY GARAGE DOOR WHEN IT’S OUT OF ITS TRACKS? HOW DO I GET MY GARAGE DOOR CHAIN BACK ON? The garage door drive chain has come off for a reason which usually requires professional repair. Contact us today, and we can help. WHAT IS THE BEST WAY TO FIX AN EMERGENCY GARAGE DOOR REPAIR? Trying to fix your garage door in an emergency can often cause more expense than getting the professionals out. Don’t risk your safety and security – call a professional garage door repair company so you can have your door working safely again. HOW DO I FIX MY GARAGE DOOR CABLES? Your cables provide the perfect balance for your garage door. If done incorrectly, they can cause major damage to your door, which is why we don’t recommend DIY on your garage door cables. HOW DO I FIX MY GARAGE DOOR PANEL? If damaged, some garage door panels can be manipulated and strengthened back to their original form; others may require a full replacement. MY DOOR ALIGNMENT ISN’T CORRECT; HOW CAN I FIX IT? If your door alignment isn’t correct, then you run the risk of the panels popping out. It’s always best to have a professional look at this for you. CAN I FIX THE DENT IN MY GARAGE DOOR? Sometimes, depending on the size and nature of the dent, we can manipulate the panel and have the door working as well as new in no time. MY EMERGENCY RELEASE IS BROKEN; CAN YOU FIX THIS? Yes, usually an emergency release repair takes around 15 minutes to complete. 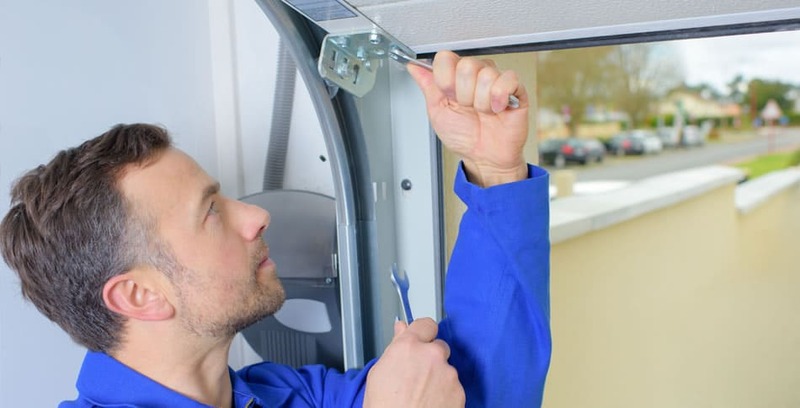 We then service the door to prevent it from happening again, as this is a sign that your door has either been impacted or is overdue for a service. WHY DOESN’T MY GARAGE DOOR OPEN? WILL YOU INSTALL A MOTOR I HAVE BOUGHT ELSEWHERE? Guardian will install ANY door motor you require and service the door, giving you the best chance at having an efficiently operating garage door. WHICH GARAGE DOOR OPENERS DO YOU INSTALL? Guardian Doors installs a wide range of door openers, from Guardian 21230L, Merlin, B&D, Nice, Avanti and many more. CAN YOU FIX MY GARAGE DOOR WEATHER SEAL? Yes, we can replace the garage door weather seal on all doors, ensuring the elements and debris stay clear from your door. HOW DO I FIX MY GARAGE DOOR SENSORS? Call Guardian Doors, and we can go through some trouble-shooting to find out what is causing the sensor issue, then help you to fix it. CAN I FIX MY GARAGE DOOR AFTER I’VE HIT IT WITH A CAR? 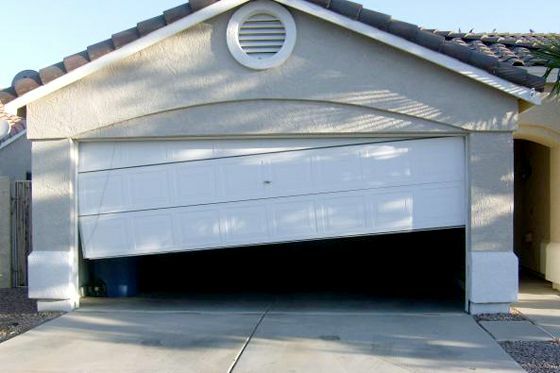 If your garage door has been hit by your car, sometimes the garage door can be manipulated to its previous state, and sometimes we have to look at replacing the panels. As each repair case is individual, it’s best if you call Guardian Doors to find out how we can repair your garage door. Contact us for Garage Door Repairs!